My first love has always been and will always be wire work, but that doesn’t mean I don’t appreciate other forms of metalwork – I do. 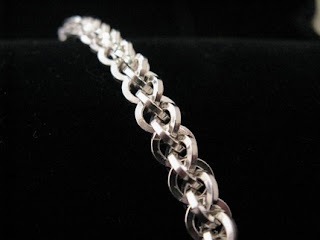 I have actually spent a great deal of time learning and working chainmaille. Despite being on the tedious side, it can be very relaxing – even calming. 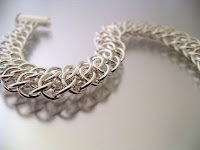 One dear friend on Etsy – who by the way swears she couldn’t do wire wrapping to save her soul – runs circles around me in chainmaille. Meet Deb of MailleMystique. 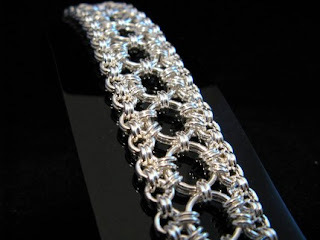 Now I know a lot of folks regard chainmaille as a ‘Renaissance Fair’ craft with images of maille clothing and such coming to mind first, but Deb creates beautiful jewelry that goes far past that. One piece in particular. One of my favorite people, and very gifted. Wow, thank you sooooooooo much. You just made my day, week and month!